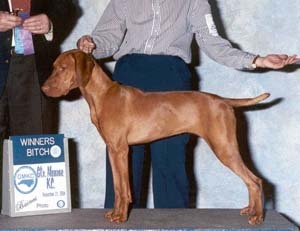 Intl Ch Ky's Golden Goal! 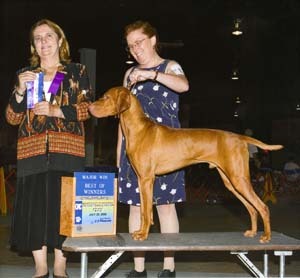 I am so proud of my Vizslas! 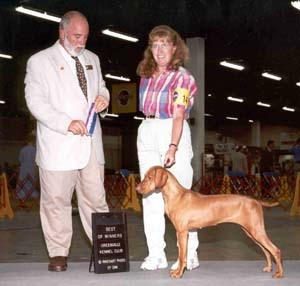 Rose only needs one Major to finish her AKC Championship. Not bad for my 1st bred by keeper! She finished her IABCA International Championship in one weekend! 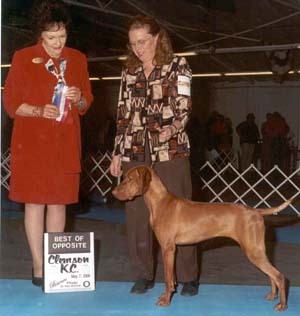 Orion, Rose's Brother, finished his AKC Championship with 3 majors. He only showed sparingly! 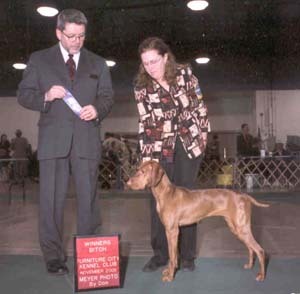 Jenny is our newest and she has been showing since May of 2008, At 14 months on January 3rd 2009, she singled out and then at 15 months she earned her Championship in Charleston on Jan. 24 & 25, with back to back majors under judges Mrs. Karen Wilson and Dr. Alvin Krause. 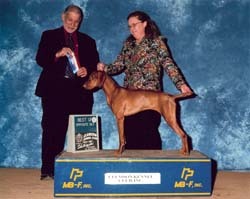 Thus far she has won: 5 BOB, a Puppy Group 1 placement, and BBE Group 3 and Group 4 placements! 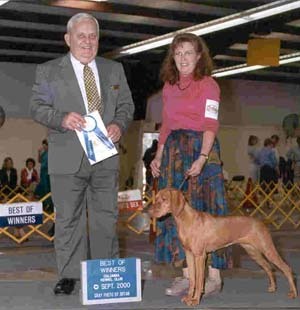 In Dec. 08 she earned her 1st two Jr. Hunt test legs, and in Feb. 09 she earned her 3rd and 4th hunt test legs to complete her Junior Hunt Title. In Greenville she earned two more BOB as her 1st time out as a champion! 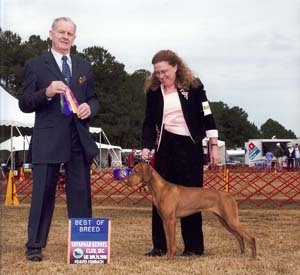 Copper, he is Jenny's littermate....Finished his AKC Championship on 10/31/2009 with 3 majors. 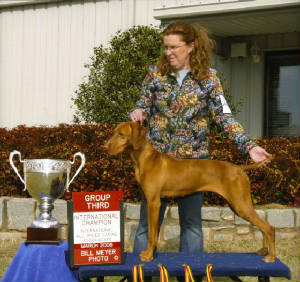 He finished with a 5 pt major the Week of the VCA Nationals at the Vizsla Club of the Carolinas Specialty! What a way to finish! 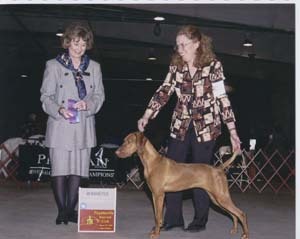 Brandy Wins, 1st time in the Ring! Orion's 2nd major win in Greenville! 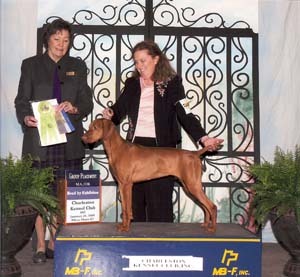 Jenny in Savannah going Best of Breed! 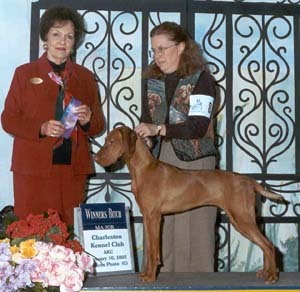 Rose, 1st Win at 9 months! Rose 4 point major win in Ladson, SC! Rose is singled out she needs one major to finish her Championship at 21 months!